I recently returned from a weeklong stay in Dubai in the Gulf region of the Middle East. I had first visited Dubai in 2013. At that time, Dubai’s stunning skyline, world-class hotels and global aspirations blew me away. If anything, Dubai’s ambitions seem to have grown since. One of seven members of the United Arab Emirates, Dubai has positioned itself as the gem of the Middle East — a peaceful pioneer of economic and social success that serves as a model for the rest of the Arab world. Once a small fishing village, Dubai obtained its independence from the British only in 1971. What it has accomplished since then is remarkable. Dubai punches far above its demographic weight. When I first visited four years ago, it had a population of 1.8 million. Today, Dubai’s population has hit 2.72 million, and will roughly double again by 2030. It is not a typical city. About 92% of Dubai’s residents are expatriates — mostly guest workers from Asia and a tight cadre of foreign professionals, enjoying the benefits of no personal income tax. Arriving at Dubai’s shiny, spacious airport, I felt both overwhelmed and embarrassed. I was overwhelmed because of its architecture and impressive organization. I was embarrassed when I compared it to the threadbare and downtrodden airports that greet foreign visitors in New York and Washington, D.C. Despite its tiny population, Dubai has an airport that welcomed a record 83.6 million passengers in 2016. That made it the third-busiest airport in the world, putting it ahead of global capitals like New York, Los Angeles, London and Hong Kong. Over the past decade, Dubai has become a playground for some of the world’s leading architects. Dubai boasts the Burj Khalifa, the world’s tallest building, and the Dubai Mall, the world’s largest shopping mall. Not one to rest on its laurels, construction of an even taller building and larger shopping mall is underway. Dubai also boasts a Donald Trump-branded golf course. The city is obsessed with having the biggest and the best. When construction of the world’s largest Ferris wheel — the Dubai Eye — was delayed, engineers updated the design so that it would remain the highest in the world once completed. Today, plans call for it to be twice as tall as the London Eye — the equivalent of a 30-story building. Dubai’s most impressive achievement is the Palm Islands — a set of man-made islands large enough to be viewed from space, complete with their version of the lost City of Atlantis. With over 3,700 building projects underway in an area the size of Rhode Island, it is no wonder the city feels like a large construction site. With Dubai hosting the next World Expo in 2020, there is no sign that this pace will abate any time soon. How can Dubai afford all of this? It turns out, the cost of putting up a skyscraper in Dubai is 20% of what it costs in New York City. Today, there are $400 billion worth of projects under construction in Dubai. The equivalent in the United States would be close to $2 trillion. That’s twice the amount President Donald Trump aspires to spend on all U.S. infrastructure over the next 10 years. 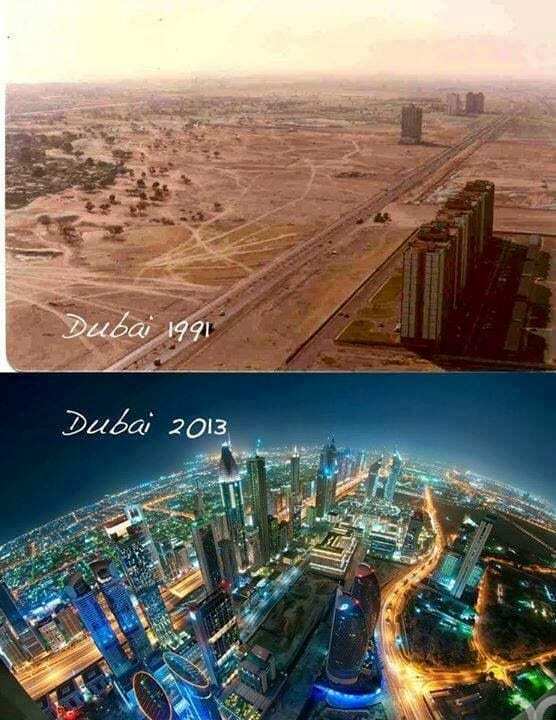 Dubai is all about planning for the future. Despite its location in the Middle East, its openness to novelty provides for a kinship more with Silicon Valley than with Old Europe. Elon Musk sought to launch his Hyperloop — a pod-like structure to whisk people at hyper speeds — between San Francisco and Los Angeles. He may still do so. But the very first Hyperloop is set to launch by 2020 and will be between Dubai and neighboring emirate Abu Dhabi. Passengers will travel between the two emirates in pods at 750 miles per hour. That’s about the speed of a passenger jet. Even more outrageously, a headline in a local newspaper discussed plans to construct a building that would dangle from an asteroid suspended in space. That certainly gives a new meaning to the word skyscraper. Dubai’s economic model challenges the tenets of freewheeling market capitalism. The heavy hand of the government is everywhere. You can’t buy alcohol in stores — though it is available in resorts and hotels. An alarm goes off if your taxi exceeds the speed limit. On the Dubai Metro, there are separate “women only” trains. I had to ride a different train car than my wife and son. While flying Emirates Airlines — the world’s best airline (of course) — I listened to an interview with the head of Dubai’s new Ministry of Happiness created in 2016. The media is, of course, state-controlled. The daily newspaper is sprinkled full of stories profiling Dubai’s relentlessly ambitious construction projects. Equally prominent are stories of the harsh punishments meted out to criminals. There is no “three strikes and you’re out” rule in Dubai. One strike is good enough. No wonder that there is next to no serious crime in Dubai. Ironically, the one occasion I was ripped off was when I used the American rideshare service, Uber. In Dubai, Uber charges you the full amount in advance and costs about 3x as much regular taxis. The government-run taxis are a much better deal. As an American, my feelings about the government’s role are mixed. On the one hand, I don’t trust any government bureaucrat whose job it is to keep me happy. Similar efforts of other enlightened despots have been little more than a thinly veiled excuse for corruption. On the other hand, Dubai’s successes compared to other Arabic countries I’ve visited are immediate, palpable and stark. It is hard to argue with its success. Critics will point out that Dubai has had it easy — that the United Arab Emirates is a “trust fund” country that just pumps money out of the ground through its oil. Others dismiss Dubai as “artificial.” The hotels and the “souks” (markets) are like Disney World — too fake and too clean to be real. By definition, Dubai lacks the Old World charm of Vienna or Prague. Still, Dubai’s sheer audacity can’t fail to impress. If you’re like most Americans, the Gulf is not a place where you typically think of investing. As it turns out, there is only one exchange-traded fund (ETF) that offers U.S. investors direct exposure to this region of the world: the WisdomTree Middle East Dividend Fund (GULF). It has about $18 million in assets and a 25% weighting in the United Arab Emirates. P.S. In my new monthly investment service, Smart Money Masters, I recommend stocks based on the latest and best “smart money” picks. Some of these may even include recommendations in out-of-the-way places like Dubai. The current Smart Money Masters portfolio includes both Warren Buffett’s and George Soros’ top investment bet. Click this link to find out more. In case you missed it, I encourage you to read my e-letter form last week about how Brexit may change the landscape of Europe. Markets and Fed policy have always shared a close relationship, but the stock markets' strong reactions to vague Fed expectations are beginning a new trend.